When I went to see the play Titus Andronicus at the Utah Shakespeare Festival last year, the auditorium for the pre-play orientation was packed. It wasn’t because patrons had flocked to see the great Shakespearean horror play, however, but a sold out performance of the musical Les Misérables. I’d heard of the latter, but never given much thought to it. Yet when the festival director described it as based on a novel by Victor Hugo — a tale of poverty and injustice — it sounded like something I would like to read. When I learned that it had been made into another movie, I requested the book from my local library. Only then did I learn that it was a 1,200+ page epic tale. 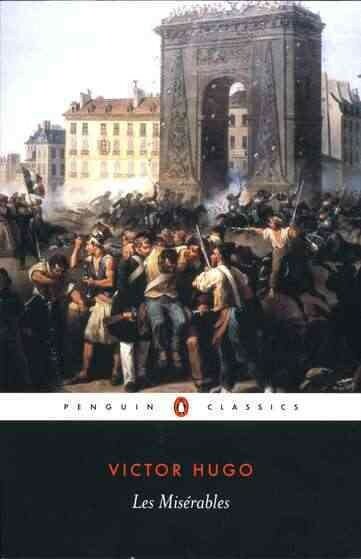 At the core of the novel Les Misérables is the character Jean Valjean. Sent to prison for stealing a loaf of bread to feed his sister’s seven starving childen, Valjean tries to escape on several occasions and ends up serving a total of 19 years. Upon his release, he is issued yellow parole papers — a scarlet letter of sorts — condemining him to rejection by almost everyone he encounters. He is finally shown mercy by an old bishop, and the events that unfold during the one night at the bishop’s parish house will change the course of Valjean’s life — for better and for worse. The book is divided into five volumes, each between 200-300 pages. Throughout the course of the story, we meet other major characters whose paths cross Valjean’s. There is the beautiful yet impoverished Fantine, her illegitimate daughter Cosette, who she entrusts to the unscrupulous opportunist Thénardier, the antangonistic police inspector Javert, the revolutionary-minded and love-struck young Marius. In its bare essence, Les Misérables is quite a compelling story — a story of injustice, ill-fortune, devotion and love — so great that I devoured it in 11 days. At times the tension was so high, that I felt like I was witness to a soap opera. I couldn’t help but pity Valjean, who despite likely being the most upright character in the story (and perhaps the wealthiest as well), was looked down upon by society and never thought he deserved his happiness. I also found it interesting that the antagonist of the story was a member of the police force — a person who society respected, yet who became obsessed with his quest for vengeance. There are so many layers of the story, and it is interesting to note that, at the time of its publication in 1862, Les Misérables was already considered a work of historic fiction. The story is set amidst the backdrop of the French Revolution, and as one of the story’s characters remarks in Volume One, the French Revolution was likely the most important event the world had seen since the birth of Christ. On one side, you have “the miserables” — the outcasts, the hungry and the paupers. On the other, you have the “bourgeoisie” — not necessarily the wealthy and upper-middle class as the word commonly denotes, but as Hugo defines, those who are ambivalent to the current political and social order. The one downside of the book, which I should mention, is the frequent digressions. For example, Hugo’s depiction of the Battle of Waterloo, which begins Volume II, likely took me a longer time to read than the battle took itself. Some of his descriptions, such as setting the stage of the convent that temporarily houses Valjean and Cosette, are interesting in an historical and philosophical sense, yet deviate from the main plot for hours of reading. I feel that no matter what I write in this review, I cannot do this book justice. This is perhaps the best book I have ever read. If you aren’t turned off by the 1,200+ pages and occasional digressions, then I highly recommend it. I have still to see the play and/or movie, and I refrained from rushing out to see the movie while it is still in the theatres. I think I learned my lesson with The Hobbit. I need time to continue pondering the book, and I will likely get the movie once its available on Netflix. While through the working of laws and customs there continues to exist a condition of social condemnation which artificially creates a human hell within civilization, and complicates with human fatality a destiny that is divine; while the three great problems of this century, the degradation of man in the proletariat, the subjection of women through hunger, the atrophy of the child by darkness, continue unresolved; while in some regions social asphyxia remains possible; in other words, and in still wider terms, while ignorace and poverty persist on earth, books such as this cannot fail to be of value.